Kitchen Ordeal or Smashing Design… Shots of Trending Kitchen design. Kitchen remodeling with multiple finishes aren’t unheard of, as a matter of fact they’re definitely trending in kitchen design right now. Homeowners are rolling out inky or bright hues on just about every surface, from window trims and baseboards to cabinets and countertops. Whether you want to play it safe with decorative pieces or go all-in, you too can get a taste of personalization. 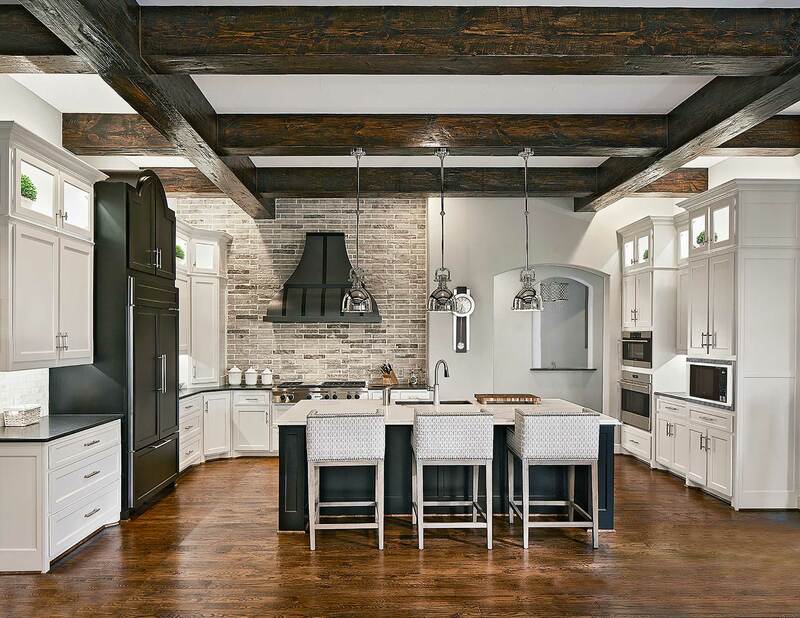 Here are ideas from a Southlake Tx kitchen remodel by the award winning designers at USI Design & Remodeling to get you started. Kitchen redesign and remodel in Southlake TX. 1. Venting hoods. We all know ventilation plays a key role in just about every kitchen design, but so can the shape and color. A European style hood with a hammered antique pewter finish may turn out to be both the centerpiece of your cooking area and your entire kitchen. Whether it’s made of stainless steel, painted wood or metal, a range hood can hold its own in a kitchen full of high-end finishes. 2.Furniture. Even though furniture involves more commitment than decor does, it’s still a relatively safe way to venture over to the many sides. While larger furniture pieces are by no means inexpensive, it certainly costs less to change out furniture than to change out countertops, backsplashes and cabinets. Less costly pieces include dining chairs and bar stools. If you’re more adventurous and understand as your kitchen design expands it directly relates to your kitchen budget expanding, try an all-black panel ready refrigerator and create your own armoire. 3.The island. Say what you want about black cabinetry, but there are few better ways to get a look that’s as smart and sophisticated. Painted black island cabinetry can fulfill so many different kitchen design desires. 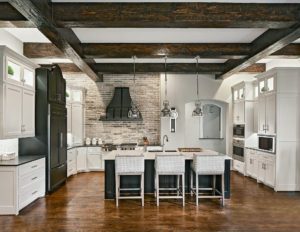 It can wow in contemporary kitchens that have a clean white palette or add a little bit of charm to farmhouse and French country designs. Let your island stand alone as an accent piece or paint another one of your cabinets to match it. 4. Countertops. If you think alternate cabinets and backsplashes are too bold, your counters are a good middle-of-the-road option. Black countertops can tie together a crisp black-and-white color scheme, and you can find them in a variety of materials, including granite, quartz and soapstone. In this Southlake Tx kitchen renovation the perimeter counters are Cambrian black satin granite.This classic kitchen maintains a light and airy design with a white marble island countertop. Our clients have enjoyed mixing alternate finishes into their projects and moreover it pairs well with our philosophy of high design for kitchen renovations.